NEW YORK, NY--(Marketwired - Oct 15, 2013) - Brookfield Office Properties Inc. (NYSE: BPO) (TSX: BPO) today announced its first investment in the San Francisco office market with the acquisition of 685 Market Street, a 205,000-square-foot class A office building in the South Financial District submarket. "San Francisco has been a market we've been enthusiastically pursuing and 685 Market Street presented the right opportunity in which to transact," said Mark Brown, global chief investment officer of Brookfield Office Properties. "The market has experienced significant growth in recent years, specifically in the technology sector, and the strength of the location and a repositioning program of this asset will attract significant interest across various industries." 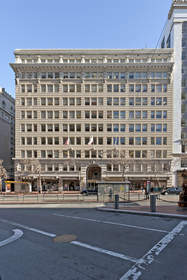 685 Market Street, also known as the Monadnock building, was originally built in 1907 and underwent a full restoration and renovation project in the late 1980s. The 10-story office building houses approximately 192,000 square feet of office space and 13,000 square feet of street-level retail. The property is currently 76% leased, creating significant upside potential for Brookfield through proactive re-leasing, capital improvements and asset management. The building's prime location at the intersection of Market Street, 3rd Street and New Montgomery Street has attracted historical occupancy in the 90% range to a diverse mix of tenants. The anchor tenant in the building is Macys.com, the online division of the prominent national retailer, which occupies approximately 46% of the building's leasable area. The building is ideally situated with adjacent access to the Montgomery Street BART and MUNI stations and is a short walk to the Union Square shopping district. Recently completed real estate developments in the area including office, residential and hotels have changed the urban landscape, bringing vitality in the evening hours and on weekends. In addition, the building is in close proximity to the Transbay Transit Center redevelopment, a $4 billion project that will link all modes of public transportation into San Francisco. The property underwent a $15 million renovation and modernization program between 1986 and 1990 during which the building's systems and infrastructure were upgraded while its historical appeal was preserved. The property has been certified LEED Gold by the U.S. Green Building Council. Brookfield Office Properties owns, develops and manages premier office properties in the United States, Canada, Australia and the United Kingdom. Its portfolio is comprised of interests in 115 properties totaling 85 million square feet in the downtown cores of New York, Washington, D.C., Houston, Los Angeles, Denver, Seattle, San Francisco, Toronto, Calgary, Ottawa, London, Sydney, Melbourne and Perth, making it the global leader in the ownership and management of office assets. Landmark properties include Brookfield Places in New York City, Toronto and Perth, Bank of America Plaza in Los Angeles, Bankers Hall in Calgary, and Darling Park in Sydney. The company's common shares trade on the NYSE and TSX under the symbol BPO. For more information, visit www.brookfieldofficeproperties.com.